Hi, me again. Here's a little recording I did today of me playing Oh Danny Boy. I resisted learning this song because it's not my very favorite and it seems a little overdone, but I bought this book of celtic fiddle tunes and after trying to learn a more exciting piece (Harvest Home) and realizing I'm just not ready for it yet, I looked for something a little slower/more mellow and settled on this one. Don't get me wrong, I think it's a beautiful song, but I'm impatient to learn something more jiving. Anyway, I've been at it a little over a week and this is where I'm at. Only this time I do swear I can play it better off camera. This was my fourth or fifth take and I only seemed to be getting more nervous each time, so I just stuck with this one. Okay, first for my self-critique. I know my bow-bouncing is out of control. I've tried all different tensions on the bow hairs so now I'm certain the tension problem is with me. It's obviously worse when I'm nervous. I've been working on, as Robyn.fnq put it, just playing the damn thing, but I know I still have work to do in that area. I wish I could just relax, grip that bow, and play it like I mean it…but I still seem to always be so tentative. It's a process, I suppose. <--- All of this is in addition to my ongoing problems with intonation and fully extending my bow arm, of course. Anyway, I'm grateful for your comments and suggestions! Anyone who has ever recorded themselves knows what you are talking about. The take right before you turned on the camera was the best. I don't think the bounciness is as bad as you think. But I listened a couple of times to see if I could see any rhyme or reason. It seemed to me that it only occurred when you were playing long notes AND they were out of tune. My thought (here comes some amateur analyzation) is that when you go into those long notes and hear yourself playing out of tune you tense up and/or lighten up the bow so that the note isn't as loud. 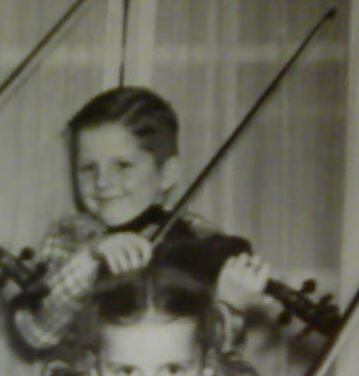 That's a pretty natural response when playing the fiddle, oh wrong note, don't play it so loud so nobody hears it. Next time you play it in front of the camera (and you should!) try and really dig into those long notes. Say to yourself "This is going to be the most passionate out of tune note ever!!". See if that helps the bouncy bow. One stylistic thing is try use some more dynamics in your playing. You've got the tune down now give it some life. Pretend you're playing for a movie score, think about how dramatic it needs to sound for that. Anyhoo great job, keep up the good work! Very nice for only 2 weeks. I heard no major problem's with your intonation that won't work it's way out in time, in fact I think it's great for the short time you've been playing. The tension on the bow hair's doesn't really have anything to do with bow bounce, it's only a matter of pressure and balance which will come in time. 90% of the member's here have had their share of bow bounce, but it's been awhile since that topic has been brought up, therefore, I think most have conquered it, you will too. As for your bowing, your right arm is in fact a slight problem. Try putting your back to the wall, turn your body at a 45° angle and try to keep your right elbow close to the wall. Your shoulder should move up and down not as much forward as you are doing. Also, practice while watching yourself in a mirror. I think you did wonderfully for only just starting it. I think all the little things will work themselves out with more playing. @fiddlinsteudel Please give us some ideas of dynamics or ornamentation that we can add to this song. This is an issue I have too. I'll get a tune down ok but trying to make it a bit fancier is where I get lost! If I get a moment I'll try and do a video, but as a starting point, when you the phrase goes down get quieter and when the phrase goes up get louder. If it's just one or two notes up or down you might not do anything. More specifically when going from the A part to the B part, that begs to have the piece swell up to those high notes. So I might do something where I get quiet as I end the A part and really swell (get louder) up into the B part. Not sure if that make sense. Anyway I'll try and do a video if someone else doesn't first. I enjoyed it.. I have never learned it. It is a beautiful song. Now on my list for the next year. Good Job. I am not good for offering tips to often as I have too many issues and things to work on. I do like how you play and sway and get into the music. I enjoy that engagement in a player. It seems you know the timing and gist of the song! Right on. Thanks! Yes, perfect sense! Thanks. When I start a new song I normally look at several different versions of it on youtube in order to see what different things are done with it. Don't know that it helps as I am just now working on learning by ear. The 'very little' bow bounce that you have will go away very soon. There a number of causes for it and not the least of them is the video camera. But the more you record, the less the phobia will become. I used to have a 'big' bow bounce problem but for the most part it's gone. It revisits occasionally for a while, not as bad as before, and then goes away. I still have the 'cam phobia' but it's getting better. One thing that will help the dynamics is to sing the tune in your head while you are playing and play it the way you are singing it. All in all, great job for the amount of time you've been playing. For less bouncing, think about pulling the bow as you do with a paint brush. It's still early to work too intensely on this technique but keep it in mind and see if it helps. When you play a down bow it looks like your are pushing the bow down instead of pulling it. Also, have a good listen to your intonation as you go up on the A string. Your pitch creeps up a bit too much which I am fairly certain you have noticed. Thanks for the post and keep up the great work. As always, thanks everyone! I admit I feel too "beginner" to think about dynamics, but it probably is something I should think about. FM, you're right about both the way I push instead of pull the bow, and about the A string. I notice I have to consciously place my fingers lower than I think I should or else I go sharp. Part of the problem, I think, is that I feel like I'm going to drop the fiddle when I play on the higher strings, which is part of the reason I feel like I need a different chin rest. You may or may not be interested but I found a neat software tool on http://www.fiddlefork.com . It is a software program called Fiddle Scales 2.0. Check it out. I use it everyday and I've learned various ways of using it to add to my practice of scales and intonation. The best part, it's free! On the website click on "free music downloads" and you will see it in the lower right corner. I think you are doing great laserbrainz. Dynamics as fiddlinsteudel was talking about can change the whole tune around. As I watched a few times you already are implementing them a bit even though you don't realize it. 1:08,1:20. You probably use them more when your are off camera. As time goes on they will come more natural. The Viddle is an extension of your musical soul so its gonna happen and you seem to really enjoy playing and thats the ticket. I really don't like doing vids cause it causes me more frustration and takes up what could be playing time but I think its very helpful cause not only do you get a lot of valuable input from others but its a tool for one to watch themselves play and critique themselves. I always get it wrong when I do a vid but its sort of a musical fix I need to have. Its great that you are putting vids out of you playing > I really enjoy them. Nice playing. You are doing well. I think a lot of the problem is nerves. I experience the same thing.